Several News agencies have reported that at least 86 people have been killed in attacks in central Nigeria. 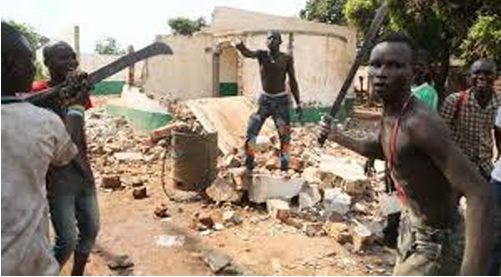 The attack, was carried out by armed Fulani herdsmen, on Saturday in Jos, the capital city of Plateau State, according to a police statement reports. "Eighty six persons all together were killed, six people injured, fifty houses burnt," police spokesman Terna Tyopev was quoted as saying in local media reports. Clashes between the Fulani herdsmen, who are mostly Muslims, and farmers, who are predominantly Christians, have occurred in Nigeria's Middle Belt since 2013 and are becoming more common.Nigerian President Muhammadu Buhari posted a message on Twitter sending condolences to those affected and appealing for calm. "The grievous loss of lives and property arising from the killings in Plateau today is painful and regrettable," he said. "We will not rest until all murderers and criminal elements and their sponsors are incapacitated and brought to justice," Buhari said. Nigeria is already dealing with a Boko Haram insurgency, which has killed thousands of people and displaced millions over 10 years. Buhari, who is ethnically Fulani, has been accused of not doing enough to stop the violence and he is criticized on social media for his inaction.